Among many interpretations of Babel Tower story there is one about technological independence. It implies that mankind has so advanced in terms of technological sophistication that it can do without God’s help. Today as we move into future full of driverless cars and smart assistants’, it looks we stand on the verge of new rationality. What a lucky chance to witness the new Age of Enlightenment. The Dawn of smart tools. The creation once again looks like a promising set of building blocks, or rather programmable units if you ask a typical Silicon Valley resident. Artificial Intelligence is a perfect candidate for Tower of Babel of our time. The question is: will we build it properly this time around? The core of the story is “debunking the mystery”. For today’s technology priests there is hardly any mystery to nature that neuroscience and modern genetics cannot explain. Killing the mystery is the same old “killing of God” according to famous Nietzsche stance. Numbers tell it: we are killing the mystery with the speed of 3 million scientific papers published each year. And each new discovery from AI corner persuades us that Mystery loses its ground. After all, isn’t it true that neural networks can learn, solve problems better than us? And if you strip humans of all metaphysical depth, you’ll be left with programmable parts and a set of handy technology metaphors: consciousness that can be downloaded onto a drive, code of existence, God being a coder and us willing to “out-code” him and take his position. So far there is no scientific consensus as to what consciousness is and how it relates to the brain. But still, Artificial Intelligence has moved far enough on the line, to persuade many that reality is fundamentally mechanistic or artificial. Among the AI enthusiasts there is a strong feeling that social phenomena are too programmable concepts. You were programmed and conditioned by the family, society, culture, etc thus you too are a robot. Human vs Replicant problem hits us at the core long before 2049 (The Blade Runner movie). So, an ubiquitous Free Will vs Determinism question pops up, and to go further we’ll need to outline a few more parallels or even alternative definitions of the same battle. These classic oppositions are here to show that the Artificial Intelligence problem is only a fancy dress for a centuries-old conundrum. What is the relation between whole and its parts? As we just saw, what AI enthusiasts believe that there is no magic ingredient to human existence. One problem with that view is that it holds reality as fixed. Yes, the neural networks can learn and create new combinations from initial parts but we’re still in a billiard ball or lego brick universe — is it because it’s easier to build towers that way? Existence is regarded as comprised of neutral strings of code. Can Functional and Meaningful ever come together? Despite the love for oppositions, Human vs Replicant dilemma, doesn’t make sense from a scientific ground. It’s not that the line between both is blurry. It’s constant re-inventing the balance between two that really counts. On a larger scale, you are both a Replicant and Human at the same time. And the line between two is drawn, as we’ll hope to explain, with a blade of a present moment. Frankly, if a system is built upon past knowledge it is already leaning towards the mechanical side. Now is the only time where one can dismiss all previous history and exert one’s free will to break schedules or make mistakes, or stop being a robot. The free will has the only one place to dwell, the Now. For example, we may argue that animals act deterministically according to the intensity of their awareness. It has been proved that animals that are more self aware demonstrate more flexibility in their actions. Now is the moment of waking up from past and future schemes. Consciousness is experiencing the present. You may look at it as “recorded” versus “live on air”: inanimate objects follow the pre-recorded script, whereas living objects vibrate and “improvise” on the fly. An important addition — they do so along with the rest of the world, being included, so to say, to the universal circuit. 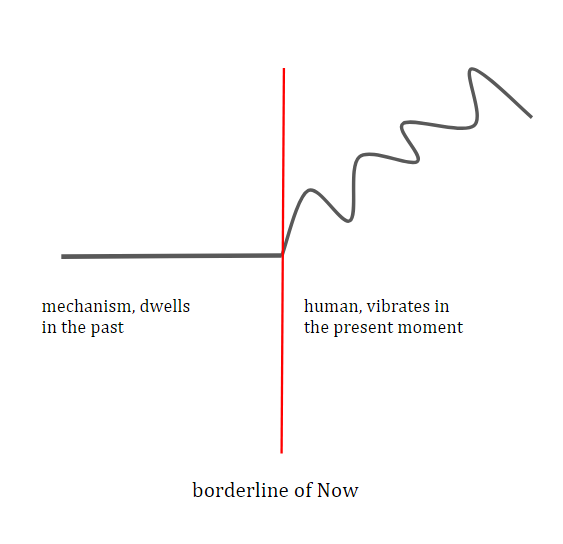 According to this view, determinism is partly dissolved in the now. Because consciousness is an active process of experiencing now-ness. Awareness or the process of observation can be viewed as a subjective definition of now. The difference between the classic and the quantum physics is the idea of the Observer, Witness, Conscious agent, while observation or experiencing is by definition only possible in a present moment. And that “blade” from Blade Runner is none other than the blade of an active awareness. Hence, a chance to resurrect Mystery or a notion of the Divine. The Babel Towers fall because they become too much stuck in the past, rigid, not allowing for unexpected to happen. They betrayed the Now for the already known. Probably, the same reason chatbots can’t tell you much about what’s happening now. Being aware to what happens Now is the window to bigger picture, the channel to communicate with the Universal. If the balance has shifted too much in favor of order or chaos, respectively, you’ll run into trouble. Life gives us plenty examples of this in a practical sense. Try following a strictly determined plan for some considerable time, like promising yourself to go to the gym you repeat every January. Try it and you’ll soon risk to be torn apart by waves of everyday’s chaos. Try engaging in a party talk with a scripted plan, and not surprisingly, all your ready-made templates will fall flat. True not only for jazz music: improvisation is as just important as your learned note-sheet. The more we try to eliminate the uncertainty, the more it re-emerges on a different level. Building of Babylon Tower is the attempt to eliminate unpredictability, because God is, in essence, unpredictable. Following a strictly functional scheme or game plan day after day is akin to building your own personal Tower of Babel . So, we have to be very careful and stay away from hypnotic mantras of AI, human-computer hybrids, Humanity 3.0 approaches which are being pounded into us by current paradigm. Largely because it’s the same old reductionism covered in a latest digital dress. Though helpful practically, these metaphors are utterly limiting: brain is not entirely a computer, reality is not entirely a simulation. The baby, quite big really, the consciousness, has been splashed with the water. We don’t know exactly what consciousness is, but we do know enough to see that any artificial, static models that ignore the dynamic nature of consciousness will fail. Such towers are not viable. Model is not a living object, Map is not exactly a territory. Those who played Jenga Tower know the game is about balance. Towers not rooted in balance always crumble. For all phenomena around us — from family issues to rocket engineering — the static things have to be balanced with more dynamic vibrational things. Objects have to be balanced with processes, static nouns leveled with dynamic verbs. Still, there is something in the idea of breaking the norm or rebellion against order if the language itself keeps supplying us with examples of “chaotic.” Despite being surrounded by digital calendars, orderly grids, blind algorithms and planners, we keep praising “crazy ideas”, maverick thinkers, digital revolution, fancy terms like “disruption” or paradigm shift. There is something in the fabric of reality that wants to overturn the table, something to counter-balance the tyranny of “ordung.” An archetype of an unpredictable trickster to shatter the serenity of Disneyland. You can make a tower out of clocks, but try that with clouds. But are clocks and clouds really a hard-core dichotomy? Can they be treated transitionally, as a gradient? In a vast range of examples, “connected” and “separate” are two sides of the same coin. After all, physics still haven’t figured out how to dissect the “wave-particle” duo. Let’s consider neurons. The neuron is an individual hub for a global stream of data. The neuron belongs to a network, yet is functionally separate. Human brain, in the same manner, is a separate container for a global flow of information. We may say that most things constantly switch in and out between “separated” and “connected” states much like us, when we have to act as members of the group, and then, switch to free individuals a second later. 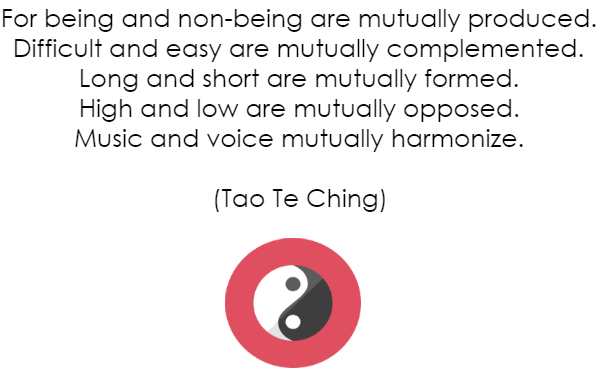 It’s healthy to be able to recognize two forces in action underneath seemingly unrelated processes, because concepts like “Ying” and “Yang” rarely travel outside esoteric domain. And unjustly so, because they are nicely applicable to everything from trading commodities to cosmic flights. For the purpose of this article though, we continue to interpret these two forces in slightly different light as “separate” and “connected” objects. The good example of “clocks” vs “clouds” is a gothic cathedral. They are amazing orderly structures, planned to house highly ritualized and dogmatic ceremonies — “separated, fixed” element. At the same time, there is a balancing element of mystery: the pouring light, music, beauty, anything that produces a direct, first-hand revelatory experience. 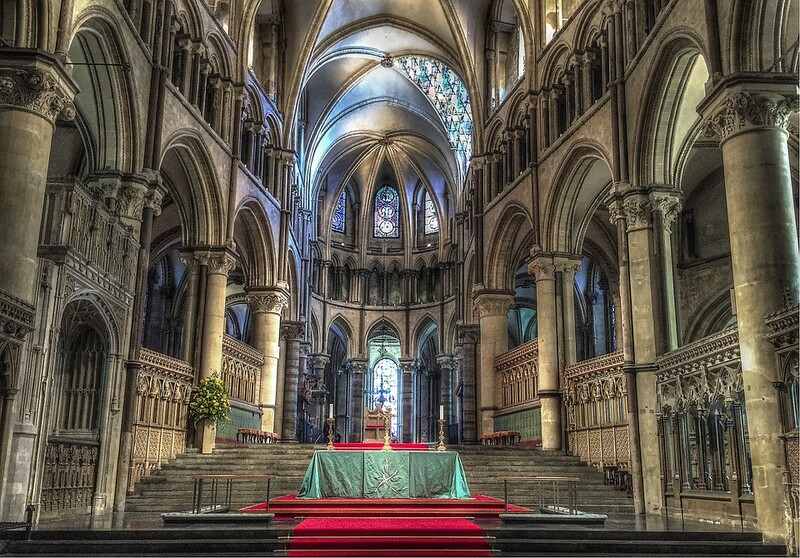 Gothic cathedrals are places where mystery marries plan. This is exactly what happens to a church visitor — you are suddenly connected to a universal context, switch from a particle to a wave state so you can vibrate with the rest of the existence. Not surprisingly, latin word “religare” in “religion” means to connect, which is what every religion is supposed to do. A prayer is a password to establish connection. One last example concerns the language as such. Every sentence is an example of structure — separate elements governed by syntax. Yet, the meaning of the sentence doesn’t derive from letters, nor from the words per se. The meaning emerges as a spark of unity and requires a conscious observer that processes meaning in the Now. “I hate you” would mean two different things being said in different moments of time. There has to be a Wave of meaning to consolidate the Particles of text. And waves as we’ve seen, belong to a living, not a fixed universe. This is how Flow interacts with Structure. And this game is infinitely fractal. From what we’ve seen two forces should stay in constant dialogue. There is a metaphysical context involved each time two opposites meet. Heaven meets Earth, The Known meets the Unknown and, liberals hopefully start talking to conservatives. This is why it is deeply concerning to see the “mystic” element being forced out from the game by neo-rationalist thinkers, Ray Kurzweil type. 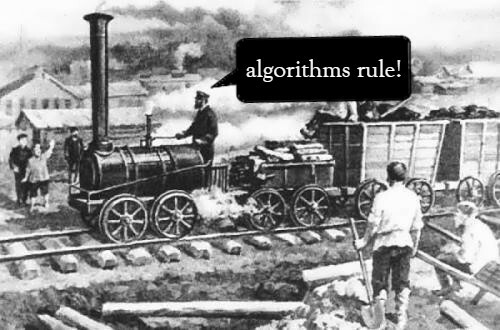 Today’s data engineers from Google or Facebook are much like industrial age pioneers, builders of first railroads, mesmerized by power of steam, steel, and their own omnipotence, fighting against Nature (this time, the human one). In the age of technological revolution Rationality seems to be winning (the tower still looks strong) but it only takes time for the Mystery to gain strength and kick it right at its foundation. Sadly, we are not hearing much dialogue between mystics and engineers. The current AI discourse revolves around “codifying”, “structuring”, “programming”, all left-brain approaches. Sure, we can never talk about “divine revelations” in the way we talk about pieces of code but at least we should admit the possibility of some “higher” structures in humans — sweeping mystery under the rug isn’t much of a solution. 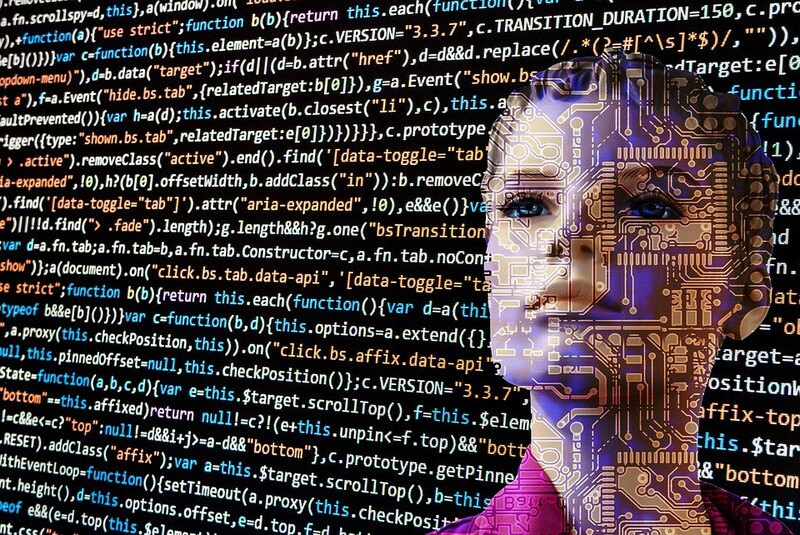 While so far, the winning paradigm has it that culture is too a program and human is reduced to merely an irrational chat-bot, with a slight optimism that all paradoxes and inconsistencies will be sorted out later. Some central things to human existence (like direct experience, intuition, synchronicities, “qualia”) are being continuously swept under the rug, or interpreted mechanically. The modern computer science must embrace irrationality to succeed. This is just how good towers are built. The above should illustrate a point why Bible views Babel tower as a rebellion against God. Any structure that ignores higher dimensions and human depth is a false promise. There never existed any pure human-less engineering like there has never been a major physics discovery without a grain of chance or intuition. Now, the makers of new Information Revolution are tempting us with artificial-ness, driver-less, human-free tools, removing human out of the equation, under the notion that technological sophistication is enough to replace meaning. Amusingly enough, Babel Tower story ends when the capability for dialogue is lost. Everybody starts talking in different language. The middle ground is lost, so the tower is out of balance. Hopefully, in course of building the Artificial Intelligence we’ll end up not with a smart talking robot, but finally a human who can listen and understand.